Dan Ryan spent 20 years covering sports in Tucson, Pima County and the state of Arizona as sports director for KVOA-TV. His career had him reporting on everything from the University of Arizona’s runs to the Final Four to local car racing at Tucson Raceway Park. 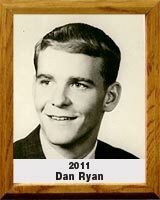 Among Ryan’s proudest achievements is establishing premier high school sports coverage, not only for football, but also for boys’ and girls’ basketball, baseball and softball. He started the “Prep Preview” program in 1988 and also initiated a Player of the Week award that continues today. KVOA was the only station in Tucson that consistently featured motorsports locally, highlighted by weekly races at TRP and the popular NASCAR Winter Heat series, which was broadcast nationally on ESPN and TNN. Ryan reported to KVOA viewers as racing stars Greg Bifffle, Ron Hornaday, Kurt Busch and others raced in Tucson early in their careers.